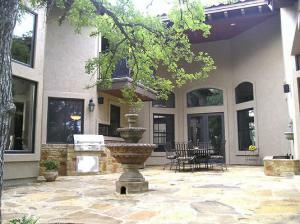 To make your deck, porch, patio or other outdoor structure into an outdoor living space, patio furniture is necessary. The problem is that there are way too many options! Here’s a quick guide to help you choose the right material furniture for your space, tastes and budgets. 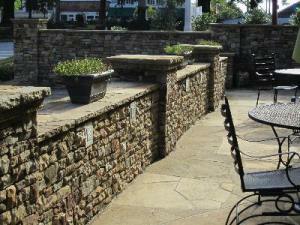 Aluminum is a great outdoor furniture option for many areas of the country. Its powder-coat finish is extremely durable and doesn’t rust or fade, making it perfect for salty or wet locations. Aluminum is easy to clean with some soapy water and it’s easy to move around with its light weight. Because it is so malleable, aluminum outdoor furniture tends to come in a wide variety of styles. Aluminum’s light weight is both a pro and a con of the material. High winds can move the furniture around so it’s good to protect it by placing it inside when particularly bad weather is expected. Additionally, aluminum does hold heat and can be hot to sit on when left out in the sun. Plastic is often the cheapest option when it comes to outdoor furniture. Sold at most big box stores, it is very portable and usually stackable for easy storage. Although it’s the least expensive option, plastic is also the least durable option for outdoor furniture. It can fade when left out in the sun and break easily. Steel is very durable and, unlike aluminum, won’t move around in hard winds. When protected appropriately it can withstand the elements well. Steel, because of its heft, can be expensive and difficult to move around in a space. It requires a protective coating of some sort to prevent it from rusting. Wicker can come in both woven wood or synthetic versions (synthetic wickers holds up well in the elements, wood may need to have some type of sealant). 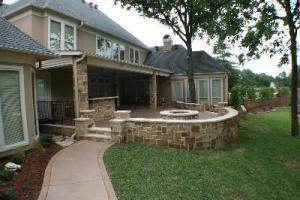 It is both lightweight, making it easy to move around your outdoor living spaces and durable. Cleaning wicker is easy with a hose and mild soap. 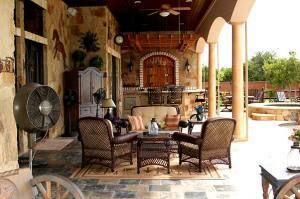 Wicker outdoor furniture sets tend to be pricey and can be too bulky for a lot of smaller spaces. Wood furniture is classic. It’s sturdy and doesn’t hold heat as much as aluminum furniture does. Cedar and Teak are two of the harder woods that are great for the outdoors. They see little effect from rain and actually have enzymes that protect against decay. Wood furniture can be expensive and there don’t seem to be as many different styles. 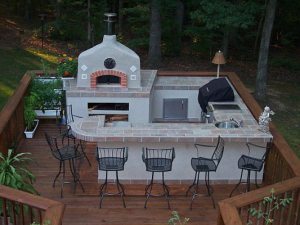 Softer woods, unlike cedar and teak, can absorb moisture and rot over time. Paint or sealant would be needed to keep water out. Pretty pitiful. 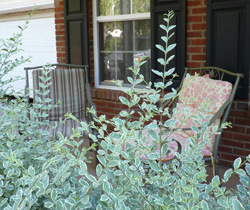 I have this beautiful Martha Stewart patio furniture with 5 chairs and 3 different seat back cushions. I tried to justify “uglifying” my set by telling the story of why I have an mismatching assortment of seat back pillows. My set is over 10 years old – more about that later in the article. So, it’s understandable that the original seat cushions are no longer around. So, about 5 years ago I decided to buy new seat cushions because I had a big family party coming up. I started out at Target because their design is always exquisite. And, as expected, the selection at Target was really nice. But there were 2 problems. First, the cushions that included a seat back were $70 per piece. Yikes, that’s $350 for a full set of cushions. I can’t remember exactly but that might be what I paid for my full furniture set that came complete with a gorgeous glass table and lazy Susan about 10 years ago. And, since I couldn’t confirm that there was any weather-proofing to the fabric, it was incredibly easy to dismiss the Target cushion idea. I will say that in a moment of hurry, I briefly re-considered the Target idea but when I saw they only had 2 on the shelf (as was the stock situation pretty much across the board), I realized how bad the Target solution was for me. So, what’s one to do if Target is too expensive? Well, Walmart of course. And, generally Walmart carries more stock on the shelf. When I arrived at the Walmart patio furniture and seat cover section of the store, they had two groups of seat cushions – comfortable but expensive and, well, just cheap and ugly. So, being the cheapskate that I am, I decided that the cheap ones were the best option. After all, they were new and would at least look really nice for the party. There was only one problem though. My 90-year old grandfather was coming. I could hardly imagine putting my grandfather on one of those cheap 1-inch thick cushions. Not only did it take Grandpa a long time to sit all the way down in a chair, but he was also likely to be sitting most of the time. So, I decided I would get a “focal” cushion. This was my fancy way of saying one nice cushion and 4 cheap ones. I could further justify that bad idea because the “focal” cushion Walmart had was really beautiful, it was half the price of the focal cushions at Target and it would be an aspirational cushion. My aspirational cushion was the one my other cushions aspired to look like and the one I aspired to upgrade my cheap cushions to. Now, what’s funny is how pitiful this logic is. Why would I spend money on cushions that I knew I didn’t want and ones I knew didn’t match the rest of my set? It wasn’t that I didn’t have the money to do it right the first time. I just didn’t want to spend the money to do it right the first time. Well, here it is, 5 years later, and my ugly cushions are still “aspiring”. But, the Martha Stewart patio furniture set that I bought 10 years ago doesn’t look a day older than it did when I bought it. So, if I do my math a little smarter, here’s the argument. My patio furniture set costs $424 at Home Depot today. I’ve had it for 10 years and it still is stunning. That’s $42 PER YEAR! I would have paid that much to rent the furniture – even just for one party. So, I’m taking my new logic a step further. The deck my patio furniture sits on is also 10 years old. Being the deck that “came with the house”, it hasn’t held its age. I’m frankly lucky that it’s still standing. So, as it comes time to replace the deck, I think my cushion math has finally taught me my lesson. I will have to take the price of the deck and divide that cost by the lifespan of the deck. 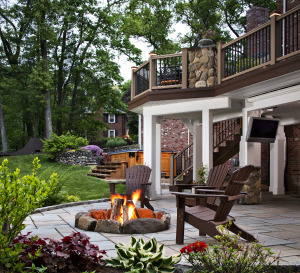 The great news is that professionally installed decking material can last from 10 years all the way up to 50 years – and it comes with a deck warranty to boot. It’s hard to imagine that wood can last up to 50 years. Exotic hardwood like IPE has an average 50-yr life span. Other hardwoods have a 30-year lifespan. And, unlike the decks that “come with the house”, the construction quality is guaranteed. So not only will it look better, it will be safer for my family, last longer, and really help my house sell whenever I decide to sell it. I’m certain that with an Archadeck deck, my home will even fetch more which just makes the return-on-investment even better. 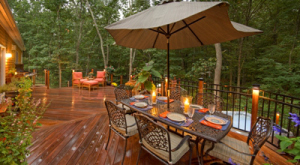 To see lots of deck photos, patio photos, porch photos and sunroom photos, check out the Archadeck website. There are literally thousands of great photos to get some ideas. There are Archadeck locations in many cities around the country. Click to see if there’s an Archadeck near you. By the way, after finding that the Martha Stewart patio line is now carried at Home Depot, I searched their site and found the new patio cushions that I’m going to invest in – for my entire set. It’s called Cayenne Paisley. 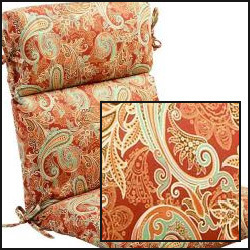 The paisley is subtle and the colors are very fun – lots of orange, green, and of course cayenne.